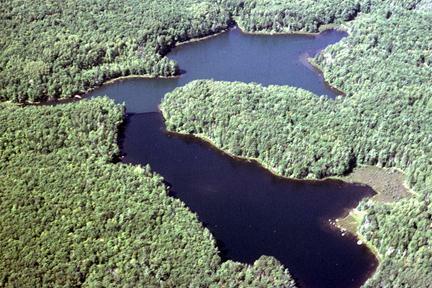 Thirty years of scientific study on a Vilas County lake will come to an end on Monday. Hourglass-shaped Little Rock Lake has been divided for 30 years. Scientists are removing a barrier that has divided Little Rock Lake in two since 1984. Researchers installed the barrier to conduct a landmark study on the effects of acid rain. Carl Watras is a research scientist with the state Department of Natural Resources. He's been involved with the Little Rock project since the beginning. Watras says at the time there was speculation about the effect of acid rain on lakes, but there was no definitive evidence. Thanks to the barrier in Little Rock lake, scientists have the proof. That proof was part of what spurred Congress to pass the Clean Air Act amendments that set limits on the sulfur dioxide emissions that contribute to acid rain. And Watras explains that building that barrier was critical to the success of the experiment. Little Rock was also the first lake where scientists demonstrated how mercury --transferred into lakes through rainfall—could accumulate in fish. Watras notes that though it’s the end of an era for the divided lake, it’s not the end of research at Little Rock. Scientists will be removing the 250 foot plastic barrier on Monday.